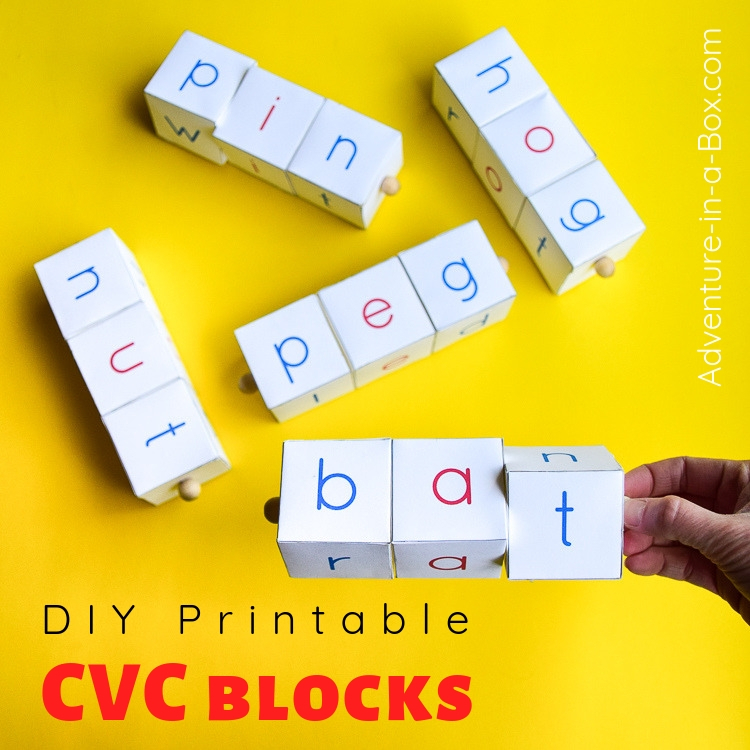 Make a DIY version of Montessori CVC Rods with Phonetic Reading Blocks for beginning readers with these printable templates! 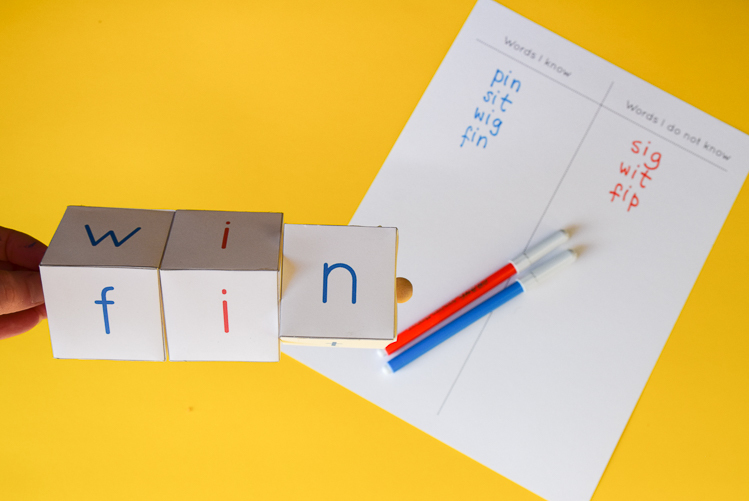 These CVC (consonant-vowel-consonant) phonetic reading blocks are inspired by the wooden blocks used in Montessori schools. 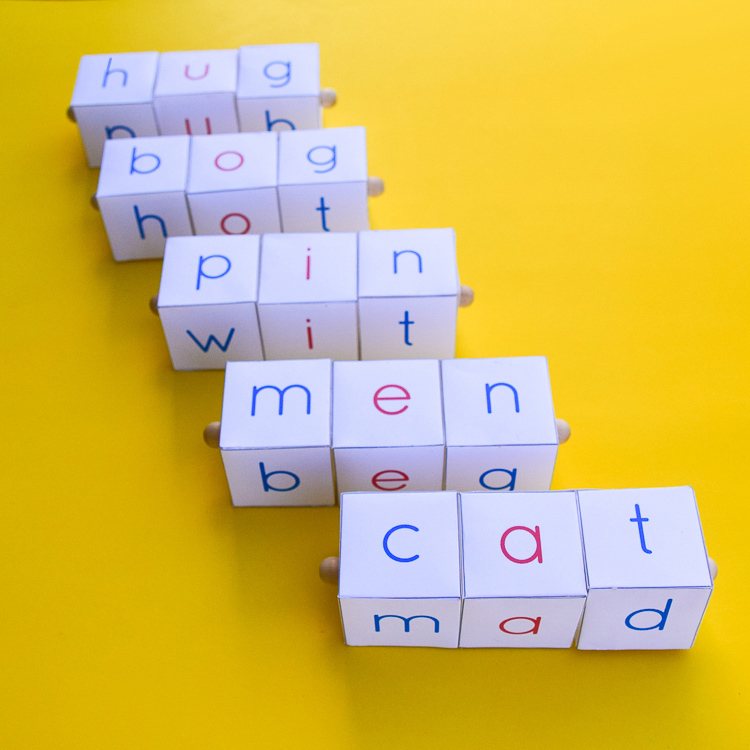 The blocks provide an opportunity for children practice easy phonetic-based reading, while using a toy that they can manipulate, twist and turn in different ways. I’ve been coveting these rods ever since my son first stepped onto the path towards learning to read. Well, coveting in my case meant “planning to make my own version”. At first, I also planned to use wood. 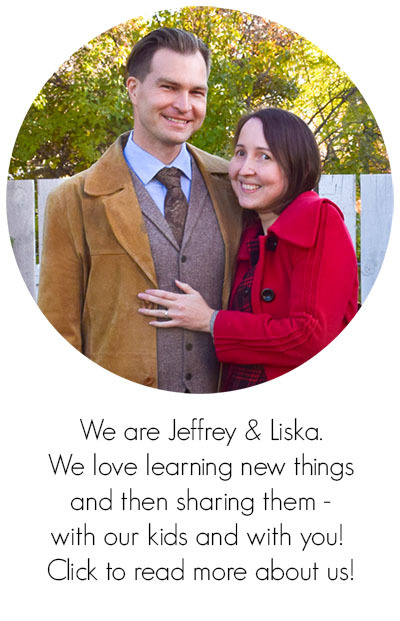 But – as much as I like wood (and over the years, we’ve created a ton of wooden toys!) – I know that not everyone has woodworking tools around. So I opted out for something that can be made quickly, using printable templates! The best thing is, children can even help cutting the blocks and putting them together. 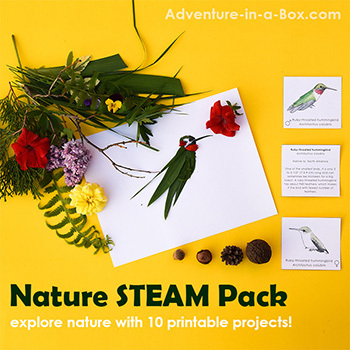 Hint: If you want to go for wooden blocks, you can still use these templates. 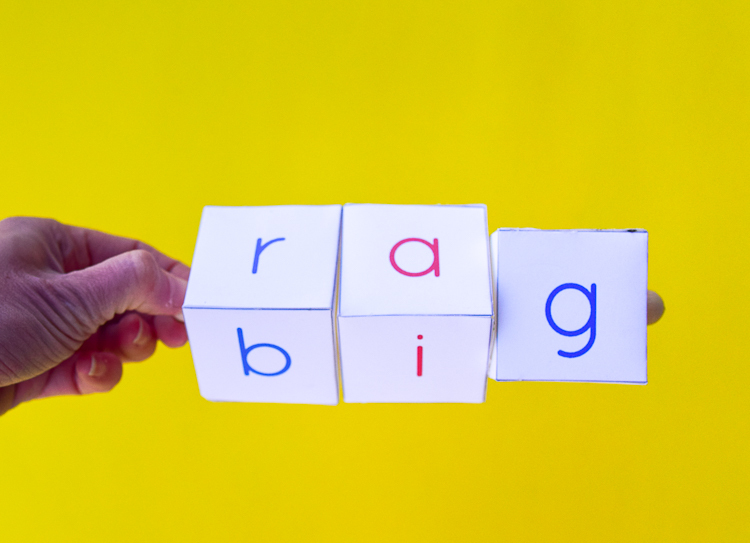 Cut the squares with letters out and glue them onto 1″ blocks! 1 — First of all, CVC rods improve children’s confidence with READING. 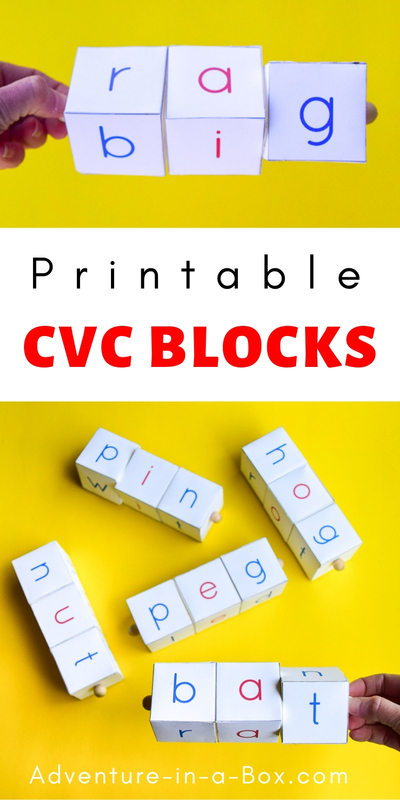 Since all of the words are based on the principle of CVC, they are very easy for beginning readers. Here I took a video of my son, who just turned 6, playing with the blocks for the first time. 2 — Children delight in twisting the CVC rods to discover NEW WORDS. While using the blocks, children will read over a hundred words! Definitions for some of the more obscure words are provided. 3 — The CVC rods introduce a big selection of WORDS THAT RHYME. Twist a block and turn “cat” into “bat” or “pig” into “fig”. And words that rhyme seem to be a hit with this age group! 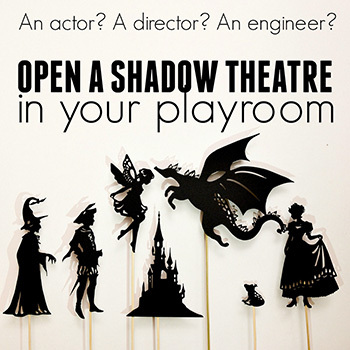 4 — ADDITIONAL ACTIVITIES are included. One encourages children to divide the words into the ones they know and the ones they do not know; the real words and nonsense words. Another suggests a list of words they can build from the blocks, then asks them to strike those words out. 5 — You can MAKE THEM YOURSELF. Or with children’s help. That will count as a fine motor skill/crafting activity. Cut the designs, keeping the designs from different rods separate. Punch tiny holes in the marked places. The holes should be the diameter of the bamboo skewer you will be using. In our case, it was 3mm (1/8″). 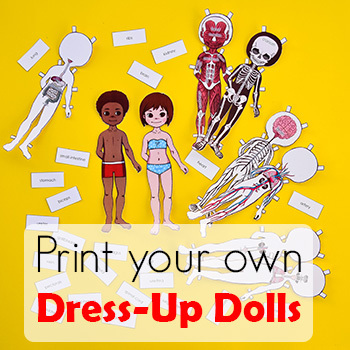 Fold them and glue them together (with the glue stick or hot glue gun). Thread the blocks onto the skewers and cut off the pointy end of the skewer. (optional) You can put small wooden beads onto the ends of the skewer to fix the blocks onto the rod. If you don’t do that, it’ll be easy to slip different blocks on and off and make even more words! 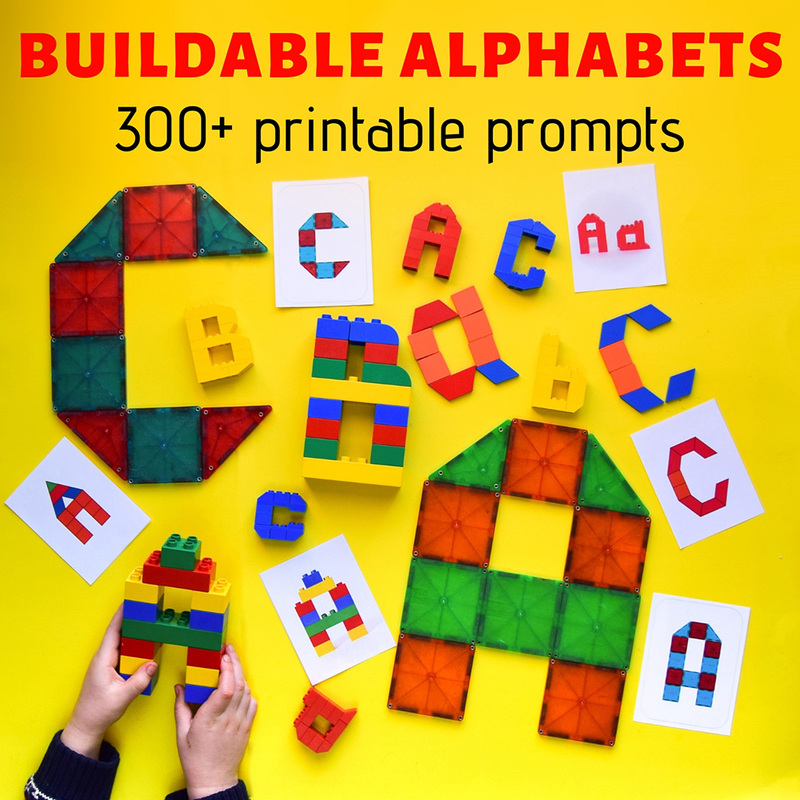 Over 300 pages of letters to build, to keep kids engaged while playing with their favourite building toys and completing STEM challenges!